Cormorants look like a combination of a goose and a loon. They are relatives of frigate birds and boobies and are a common sight around fresh and salt water, all across North America, perhaps attracting the most attention when they stand on docks, rocky islands, and channel markers, their wings spread out to dry. These solid, heavy-boned birds are experts at diving to catch small fish. Double-crested Cormorants are large waterbirds with small heads on long, kinked necks. Their heavy bodies sit low in the water. Adults are brown-black with a small patch of yellow-orange skin on the face. Immatures are browner overall, palest on the neck and breast. They have thin, strongly hooked bills, roughly the length of the head. The double-crest of the Double-crested Cormorant is only visible on adults during breeding season. The crests are white in cormorants from Alaska, and black in other regions. In the breeding season, adults develop a small double crest of stringy black or white feathers. They are about 27.6 to 35.4 inches in size (70-90 cm), with a weight of about 42 to 88 oz (1200-2500 g). Their wingspan ranges from 45 to 48 inches (114-123 cm). Breeding Double-crested Cormorants are colonial waterbirds that seek aquatic bodies big enough to support their mostly fish diet. However, they may roost and form breeding colonies on smaller lagoons or ponds, and then fly up to 40 miles (64km) to a feeding area. In addition to fishing waters, cormorants need perching areas for the considerable amount of time they spend resting each day. After fishing, cormorants retire to high, airy perches to dry off and digest their meals – rocks, wires, tops of dead trees, ship masts. After a while, masses of cormorant guano may kill these trees and the trees may topple, at which point the cormorants may switch to nesting on the ground. A cormorant’s diet is almost all fish, with just a few insects, crustaceans, or amphibians. They eat a wide variety of fish (more than 250 species have been reported), and they have impressive fishing technique: diving and chasing fish underwater with powerful propulsion from webbed feet. The tip of a cormorant’s upper bill is shaped like a hook, which is helpful for catching prey. When cormorants happen to catch a crustacean like a crayfish, they exhibit a little flair in eating it, hammering the prey on the water to shake its legs off, then flipping it in the air and catching it headfirst for easy swallowing. They tend to form breeding colonies in clusters of trees in or near water. Both Double-crested Cormorant mates work on the nest, with the male bringing most of the material and the female doing the building. The nest is mostly made of finger-size sticks, with some seaweed and flotsam, and lined with grass. Double-crested cormorants are gregarious birds that are almost always near water. Their main two activities are fishing and resting, with more than half their day spent on the latter. When at rest, a cormorant will choose an exposed spot on a bare branch or a windblown rock, and often spread its wings out, which is thought to be a means of drying their feathers after fishing. (Cormorants have less preen oil than other birds, so their feathers can get soaked rather than shedding water like a duck’s. Though this sounds like a liability, this is thought to be an adaptation that helps cormorants hunt underwater more effectively.) When swimming atop the water, cormorants ride very low, and often only their long necks are evident. Before a cormorant takes off in flight, it tends to stretch its neck in the direction it intends to fly. When it comes in for a landing, a cormorant will puff out the orange skin on its neck and, after touchdown, give a ritual little hop. If one cormorant encroaches on the space of another, such as in competition over a nest site, the cormorants will face off, stretch their necks, and open their mouths wide, to show off the blue color inside, while shaking their heads and hissing at each other. 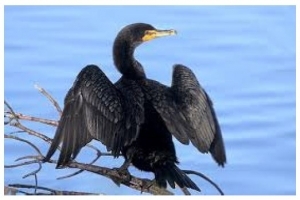 To attract a mate for the season, a male cormorant will choose a nest site and then stand with his breast down and bill and tail up, showing off the crests on his head and bright colors of his neck and eyes, grunting and slightly waving his outstretched wings. When a female arrives, she is greeted by the male opening his mouth into a gape, showing off the blue inside. There Double-crested Cormorant populations have rebounded from persecution and pesticides over the past couple centuries, and today they are a widespread and abundant species. Populations increased steadily between 1966 and 2015, according to the North American Breeding bird Survey. The North American Waterbird Conservation Plan estimates a continental population of over 740,000 breeding birds. The species rates an 8 out of 20 on the Continental Concern Score. Double-breasted Cormorant is not on the 2016 State of North America’s Birds Watch List. In the 1800s and early 1900s, cormorants were frequently shot, and their numbers declined with westward settlement. They also suffered greatly from pesticides used in the mid-20th century, such as DDT, which cormorants ingested from the fish they ate. The pesticides caused thin eggshells. Since the 1970s, cormorant populations have grown steadily, even explosively. In the Great Lakes, some cormorant colonies have doubled, in periods as short as five years. Some people still regard cormorants as a threat to fishing stocks, and the U.S. Fish and Wildlife Service sometimes issues permits for controlled cormorant shooting to protect fisheries.